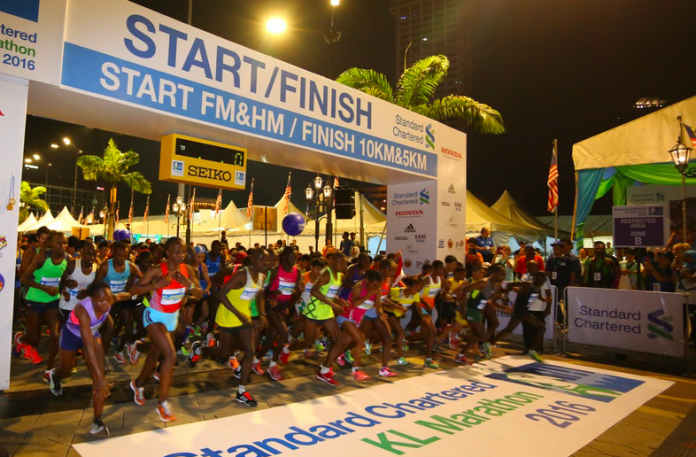 5 Things You Should Look Out For At SCKLM 2017 | JustRunLah! The BIGGEST marathon event in Malaysia is happening this weekend – Standard Chartered KL Marathon 2017! We have logged in the miles, put in the training, now it is time to do the best part of marathon running – tapering and carboloading! Let the feast begin! It’s time to put our training to the test! Here are 5 things to look out for at SCKLM 2017! The entire marathon route is pretty hilly – along the AKLEH highway (10km – 19km) and even hitting the DUKE highway (20km – 30km). But if you think the first 30km in hilly, boy are you in for a suffering ending! 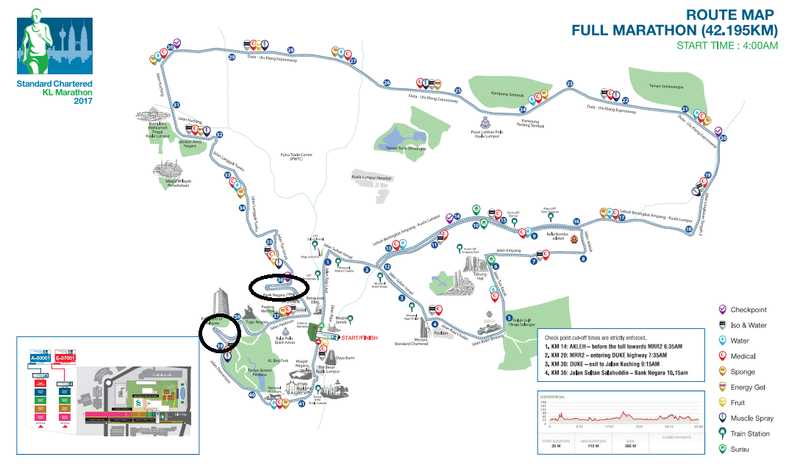 At the 33km point, you run through Kenny Hills (Bukit Tunku), and if you’re thinking again this is bad, it’s really just uphill all the way from here! After coming out from Kenny Hills, you hit a long climb along Jalan Parlimen – and this is the real silent killer! So remember, save your strength and pace yourself well to embrace the ending! There will be a slight change in route after coming out from Bukit Tunku. There are 2 minor changes after coming out from Kenny Hills. There are 2 additional U-Turns. We are not saying it is definitely going to be overdistance, but based on last years 42.5km GPS distance, with the additional 2 U-Turns, it seems that it may be some what overdistance. Please note that the 10km & 5km flagoff venue is not at Dataran Merdeka. The 10km & 5km flagoff is at Jalan Tuanku Abdul Rahman – some 1 kilometre away from Dataran Merdeka. 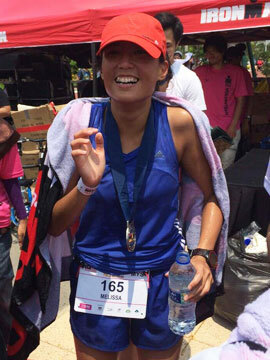 The norm is to park at the Finishing Line and take the 1 kilometre walk /jog to the starting line as a warm up. This is because the baggage storage is at the finishing area. You wouldn’t want to walk to the finishing area to store your baggage, then walk all the way to the starting point again – this would be necessary if you parked at the starting area. In contrast with other years, the race pack collection will be at a different location. This year, the RECP will be held at the KL Convention Centre, Hall 6. Time:18 and 19 May: 11 am. – 8 pm. and 20 May: 10 am. – 6 pm. 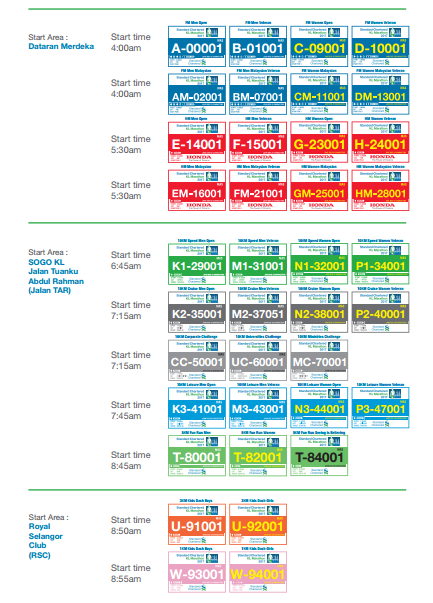 Also note that the Marathon flagoff time is at 4am. In years prior to 2016, the flagoff time was at 430am. But to allow for the more than 4 hour runners to not be in the sun for too long, the start time is bumped to 4am. Please also note the starting times for the other categories below. Remember, you’ve done all the preparations – now it’s show time! Good Luck!